Courtesy of Re/Max Coastal Homes, Jimmy Reed. Welcome to this beautiful contemporary coastal home! This upgraded 2 bedroom, 2 bath captures the essence of life near the beach. 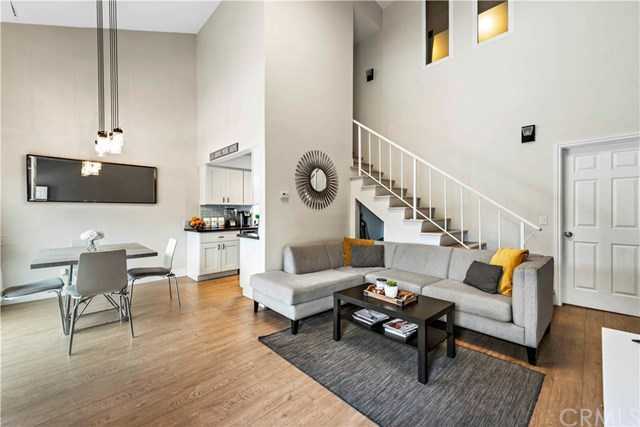 Enter into the grand, two-story open living space, detailed with accent wall paint and cascading natural light. Cozy up by the custom tile and glass rock fireplace, which boasts a stunning detailed board and batten, floor-to-ceiling hearth. Enjoy days cooking in the upgraded kitchen: Quartz countertops, white shaker cabinets, custom bronze handle details, brick-patterned frosted glass subway tile, a romantic garden window with a view, stainless steel sink, electric range and updated stainless appliances. The inviting dining area presents large windows, and a beautifully upgraded pendant chandelier. Oak style laminate flooring, and tall shaker baseboards usher you to the downstairs bedroom. Walk-in closet, in-suite full bath with slate tile flooring. Make your way upstairs to find plenty of space for linens, and a full bath. The second bedroom is spacious with frosted privacy windows, has two mirrored closets and is the perfect place to unwind and relax. Within a few minutes, find yourself at the world-famous beaches Salt Creek and Strands. Nearby restaurants, fitness centers, shopping the Laguna Niguel Racket Club, Monarch Beach golf and more. Top highly-rated local schools and amenities. Don 8217;t miss this one! Please, send me more information on this property: MLS# OC19022064 – $369,000 – 23821 Hillhurst Drive Unit 40, Laguna Niguel, CA 92677. I would like to schedule a showing appointment for this property: MLS# OC19022064 – $369,000 – 23821 Hillhurst Drive Unit 40, Laguna Niguel, CA 92677.